Some people refer to this as a "Bad Shakuhachi Day", and I think everyone experiences this from time to time. Whenever I've experienced this phenomenon, it seems to be linked to a certain level of impatience with my own warm up and relaxation. Generally I start playing fine again once I've had a chance to do some facial relaxation. - Consciously relax your muscles while playing, this includes the jaw, neck, shoulder and arm muscles, as all of these affect your playing in some way and lead into tensions in other places in the body. 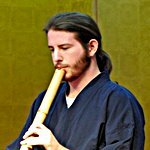 I know of a relatively famous rock musician (no, not Brian), who practiced shakuhachi for quite a few years and the first time he went up in front of an audience with a shakuhachi part, just produced a "phhhhhbttttttthhhhhhhhhhhhh" sound. It's a tough instrument to play in a pinch. 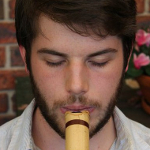 My teacher used to say "we never know exactly what will happen with shakuhachi"... Somehow, it would be sad that there isn't an unexpected part. Nevertheless it's important that stage fright is not handicapping. It is important to know how to manage the symptoms, which vary greatly among people. There are plenty of ways: relaxation, breathing, accupuncture, yoga, of course, but also working on stage presence (with actors), instrumental posture, practice of improvisation... In general a competent teacher will be able to help his students about it. More complicated (and in my opinion most important) is the work on the causes, which are usually unconscious (get rid of the gaze of others, that sort of thing...) Difficult for me to talk about it in English, but this is what has allowed me to completely get rid of stage fright for several years on both concert flute and shakuhachi. The best preventative against stage fright is to know that you will do it properly. Start out your performance or demonstration with something that is foolproof, like tsu-re, and play as slowly and simply as possible until you gain confidence in your own performance. Once you've done a few successfully you'll no longer have stage fright. Thanks so much for the replies. Nice to know it's not just me! I will definitely try some of those ideas. Another fellow shakuhachi/karateka! What style of karate do you practice? I was asked to perform to some nursery school kids in my school in Japan, my colleague prefaced it with a long speech about shakuhachi and history and generally made me sound amazing, and when it came to playing, I just went "PFFFFFFFFFFFTTTT". Of course the kids thought I was joking and cracked up laughing. I played along to hide the crushing shame and eventually relaxed enough to get some sound out. I still get slight nerves before performing but recently have found deep breathing before playing helps. It's definitely not just you! I'm also struggling with performance anxiety. When I perform, my sound is more like "PFF-FF-FF-FF-TT". Unintentional ikiyuri, perhaps. My first performance was so bad, that every time I perform, I remember the first time and think "it can't be worse than that time". The main reason my first performance was terrible is actually quite funny and embarrassing. In Japan, you know that they use slippers inside, and then sometimes there are separate slippers for bathrooms? Well, before performing, I went to the bathroom to use the mirror to check my appearance. Then I was waiting backstage where the emcee was asking me questions because she wanted to introduce me as the foreigner playing shakuhachi etc. Then we all looked down in horror at my feet as someone pointed out that I was still wearing the bright pink toilet slippers. I was about to walk onstage in them. I dashed back to the bathroom and found my blue slippers. But then my nerves were shot and my performance was a disaster! At the time, I was so embarrassed, but now I think it's funny. But the good thing from that experience is that I now consider each performance as a chance to improve my performance ability gradually, because it can only get better, right?! (I took a photo of the offending slippers a few weeks later, to prove to someone just how bright pink the toilet slippers were).